Boiling it down to its basic principle: remastering a movie is making the old new again. But is that what cineastes really want when they watch their beloved classics? Some do. With the constant proliferation of pixels in our televisions, features that make blacks really black and, by contrast, bright colors ping on the screen, a grainy washed-out version of a classic just doesn’t cut it in a world awash with 60-inch screens. But it can go too far. It’s all well and good when a piece of film is preserved. Film by its nature is fragile, something that needs to be nurtured. It’s easy to understand why some filmmakers want to protect, and project, it for future generations. There’s a romance about capturing light on film and coaxing it to life with chemicals in a darkroom that no amount of pixels will ever match. It’s a process as precise as brush on paper. Therein lies the tricky balance of movie, not film, preservation. To preserve a movie for generations to come, it’s clear that those reels of film need to be digitised, scanned and then frame by frame a restorer will get to work. This will mean that the pops and hairline tears are zapped, colors are brightened, everything is enhanced. The audio will go through some sort of new arrangement to fit into surround sound. After painstaking work by dedicated professionals, your favorite old movie is new again. But what if you don’t want that sort of restoration? What if you just want it back to how it was, if you were lucky and old enough, to watch it on the big screen all those years ago? This is what Christopher Nolan has tackled and achieved with his Unrestored version of 2001: A Space Odyssey, heading to cinemas for the movie's 50-year anniversary. Unrestored is such a telling name for it. Nolan didn’t want 2001 to new look new, but how it would have been seen in cinemas back in 1968. Working on a ‘interpositive’, protected version of the 70mm film - this meant the original print wouldn’t be touched in any way - he and Ned Price, the vice president of restoration at Warner Bros, went through the 20 reels of film and got to work ‘unrestoring’, cleaning the print with as much care as they could offer. Nolan made sure that what he did didn’t veer into interpretation. “There’s a trend and a danger of sitting there going, ‘What would the filmmaker have done if he had 5.1 sound? Or Dolby Atmos? Or laser projection?’ That’s not a road I felt in any way comfortable going down,” he told Variety. 70mm film is something Nolan does feel comfortable with, however, having shot the towering Dunkirk on the format. And what a format it is. Nolan's movie had the widest release for a 70mm movie for some 25 years. It came at a time when Quentin Tarantino was also using the format to shoot The Hateful Eight and, a few years before, director Paul Thomas Anderson used it for The Master. In some ways, Nolan married the old with the modern - using IMAX cameras - but the result is old-school filmmaking at its finest. 2001: A Space Odyssey back on the big screen is testament to the lasting legacy of film. Yes, the print has the odd scratch but at 50 years old, these are lines on a weathered face, slight imperfections that should be cherished. The audio is almost overbearing at times, without a sniff of a Dolby Atmos revision. It's taken from a near-original 35mm six-channel soundtrack and is all the better for it. Kubrick wanted the sound to be extreme and in this original mix you can hear, well, the fear. Watching it in the PictureHouse Central in London, complete with introductory music cue to a curtained-shut screen and 15-minute intermission, was a fascinating experience. The picture, for me, didn't unearth any new secrets - it's still a movie that's as beguiling as it will always be, but it did make me respect the medium. 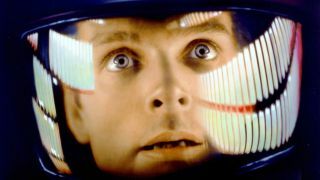 2001: A Space Odyssey is a jaw-dropping piece of cinema that has lost none of its awe 50 years down the line. What Nolan has managed to do is showcase this uncompromizing film in its most uncompromized form. This isn't about nostalgia but the preservation of what may soon be the lost art of film watching - seeing a big print on the big screen. Long may it continue. 2001: A Space Odyssey is screening in the UK at the Picturehouse Central now, before touring select cinemas from 8th June courtesy of Warner Bros.